Peppers are the easiest. The seeds are mature after the peppers have changed color, indicating final ripeness. Cut the peppers open, scrape out the seeds onto a plate—reserving the flesh for eating—and let the seeds dry in a nonhumid, shaded place, testing them occasionally until they break rather than bend. What could be simpler? Muskmelons, watermelons, and winter squash? Super easy. Cut muskmelons open, scoop the seeds into a strainer, rinse, and set out to dry. Watermelons are almost as easy. 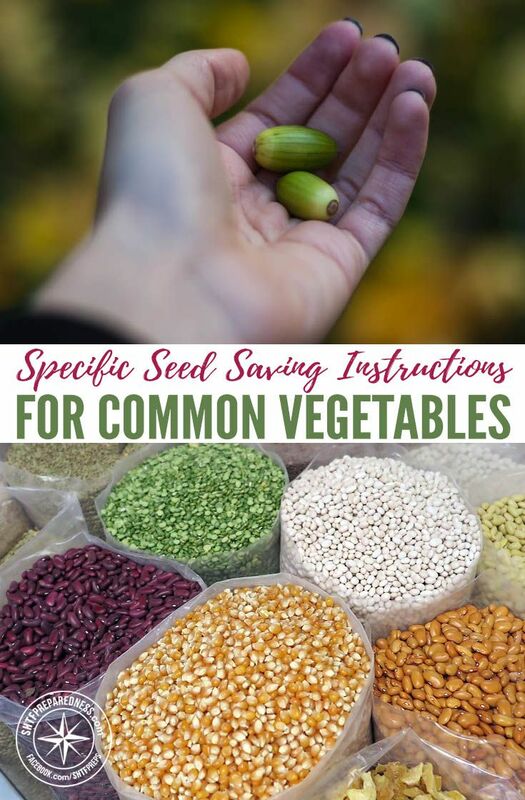 Put the seeds in a strainer and add a dash of dishwashing liquid to remove any sugar left on the seeds. Rinse and dry. Winter squashes need to be carefully cut to expose the seed cavity. Don't cut straight through the center of the squash—you'll cut through some seeds, too. Just stick the knife in as far as necessary to cut through the flesh and move it around the circumference. (Be careful—some squashes will fight back!) Pull the seeds from the fibers, rinse, and dry. And don't cut a squash before you're ready to eat it—seeds can be saved from most winter squashes many months after harvest (although a few of the long-storage varieties may have sprouted seeds inside after six months or so). To save the seeds of your eggplants, you’ll need to wait until the fruits are far past the stage when you’d pick them for eating. Any seeds saved from table-ready eggplants will be immature and won’t be viable. If left on the plant, purple eggplant varieties will ripen to a dull brownish color, green varieties to a yellowish green, and white varieties to golden. Eggplants ready for seed saving will be dull, off-colored, hard, and sometimes shriveled. Cut the ripe eggplants in half and pull the flesh away from the seeded areas. If you want to save more than a few seeds, use a food processor or blender to mash the flesh and expose the seeds. Process (without peeling), and put the pulp in a bowl. Add water, let the good seeds settle, and then pour off the water and debris. Repeat until only clean seeds remain. Add a bit more water and pour the mix through a strainer with a mesh fine enough to catch the tiny seeds. Dry the bottom of the strainer with a towel to absorb excess moisture and dump the seeds out onto a plate to dry. 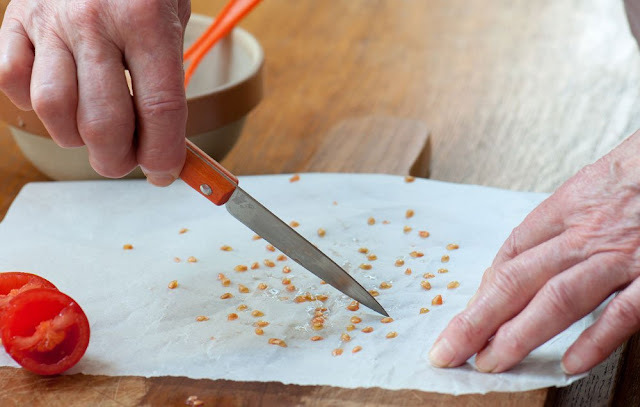 Saving tomato seeds takes a little more time, but it’s just as easy. Harvest ripe tomatoes from several different vines of the same variety, cut each across the middle, and gently squeeze the juice and seeds into a bowl. You’ll see that each tomato seed is encased in a gelatinous coating. (This prevents the seed from sprouting inside the tomato). Remove this coating by fermenting it. This mimics the natural rotting of the fruit and has the added bonus of killing any seed-borne tomato diseases that might affect next year’s crop. To ferment the seeds, add about half as much water as there are tomato seeds and juice in the bowl and stir the mixture twice a day for about three days. Keep a close eye on the mixture—especially if it’s a warm area, as fermentation happens more quickly at high temperatures. As the mixture ferments, its surface will become covered with white or gray mold. Don’t keep the bowl in the kitchen, anywhere it can be tipped over by animals or children, or where you’d be able to smell it—it will get pretty rank. When bubbles begin to rise to the top of the mass, or when a thick coat of mold has formed, stop the fermentation by adding enough water to double the mixture, and stir vigorously. The clean, good seeds will settle to the bottom of the bowl. Gently pour off mold, debris and any seeds that float (they're hollow). Add more water and repeat the process until only clean seeds remain. Capture the seeds to be saved by pouring the liquid through a strainer, wipe the strainer bottom with a towel to remove as much moisture as possible, then dump the seeds onto a glass or ceramic plate to dry. Stir twice a day to ensure even drying and to prevent the seeds from clumping together. Warning: Tomato seeds will germinate unless you dry them quickly. To speed drying, you can use a fan, but don’t put the seeds in sunlight or an oven. You’ll need to let summer squashes ripen past the tender stage, too. When you can’t dent the squash with a fingernail, the fruit is at the right stage for seed saving. Pick it, cut it open, scrape the seeds into a bowl, wash, drain, and dry.